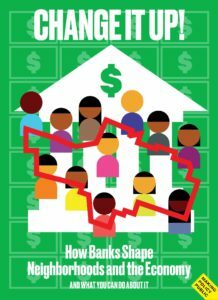 New Economy Project partnered with the Center for Urban Pedagogy and graphic designer Manuel Miranda to produce “Change It Up!” — a public policy poster that tells the story of how banks have harmed communities, and why we need a new economy. Contact us to request print copies, or download the poster here. New Economy Project thanks CUP for its collaboration through the Making Policy Public project.